Rupert Grint (Ron Weasly in Harry Potter) showed up at the premiere of “Rise of the planet of the apes” to support Tom Felton. 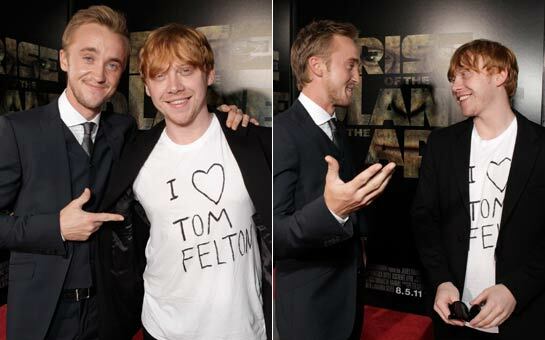 Rupert was wearing a white T-shirt that said “I <3 Tom Felton”. Together they posed for many pictures as the T-shirt had a lot of success. Tom joked: "I've had a crush on him for years and finally he's coming out, this is great!". Although I wasn’t convinced about the rest of Rupert’s outfit everybody else seems to like it. Because of the success of the shirt some people even speculated it’s could be sold in stores. Maybe someone can make one for my blog?